Macrame is the craft of knotting cord into geometric patterns with just the fingers as tools. The process can be used to create beautiful macramé jewelry ranging from simple to intricate in design. Depending on the materials used to create the items, they are suitable for casual, business and even elegant wear. Decide on a macramé jewelry project, then gather some basic supplies. A project board can either be purchased or made from cardboard. T-pins are used to secure the cord while you work. You will also need a pair of sharp scissors and craft glue for preparing the cord. Select the proper cord for your project. 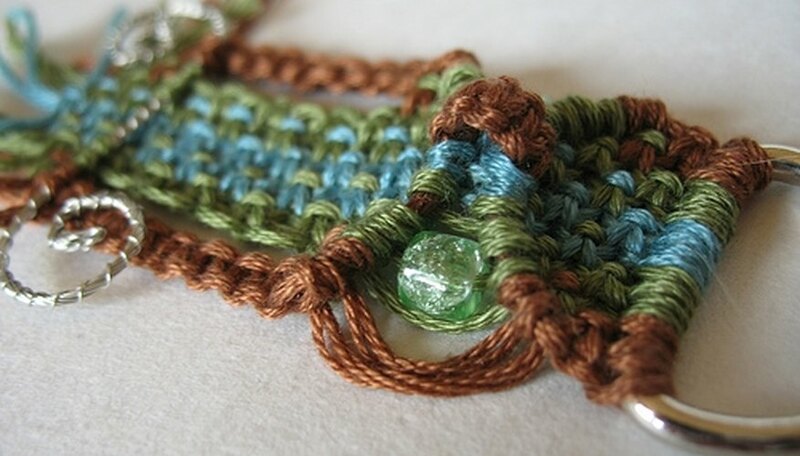 Macramé jewelry may be made out of hemp, waxed linen, cotton embroidery floss, leather cord or wire. Some cord, especially twisted types, requires preparation to avoid fraying. Cut the cord to the desired length needed for the project and dip the ends in some household craft glue that has been diluted slightly with water. Hang the cords until the glue is dry. Select your beads. Beads will give your project a personal flavor. Choose colors and materials to suit your personality. Beads come in plastic, metal, glass, wood, stone and even bone. They may be painted, carved or made into novelty shapes. Shells and novelty buttons are also used as beads. It is important to choose beads with openings that are large enough to accommodate your choice of cord. If you are working from a pattern follow the instructions on where to place the beads. If you are creating your own design, lay the beads out first to determine spacing. Tie the right knot. The alternating half-hitch forms a chain-like pattern. It maybe used for simple necklaces and bracelets. For more complex designs, space may be left between two alternating half-hitches, or double-half-hitches can be added between singles. Square knots are appropriate for hemp jewelry and wooden beads. They are reminiscent of the macramé jewelry popular in the 1960s. Consider adding a pendant in the center for a necklace, and remember to count the knots so it is centered and beads are properly spaced. Alternating square knots on multiple cords produces a net-like pattern that can be used for a choker, a bracelet or a belt. Once the basic knots have been mastered, try the Josephine knot, the monkey fist, the stevedore knot and the wrapped knot to create unique designs for macramé jewelry. These knots may be used in combination with other knots as well. Celtic knots are also used to make intricate macrame jewelry. Measure your finished piece. Make sure your project is big enough to fit your neck, wrist, waist or ankle before you cut any cords. Attach commercial fasteners with a simple overhand knot, or use a decorative knot as a fastener. A buttonhole clasp created with a series of vertical Larkshead knots makes a beautiful fastener. A bead or a button may be used on the other end, or try a Celtic button knot, a monkey fist or Chinese button knot.